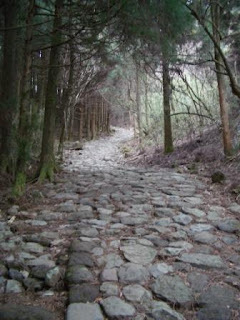 The Tōkaidō is an old paved road which used to connect Edo (sometimes written as ‘Yedo’ in early Western literature on Japan; present day Tokyo) with Kyoto. 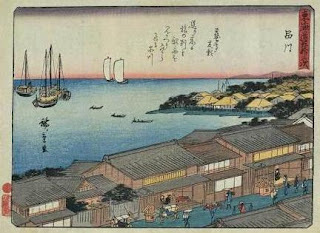 A literal translation of 東海道 (Tōkaidō) is ‘East Sea Road’ – as the road follows the eastern coast of the island of Honshū. 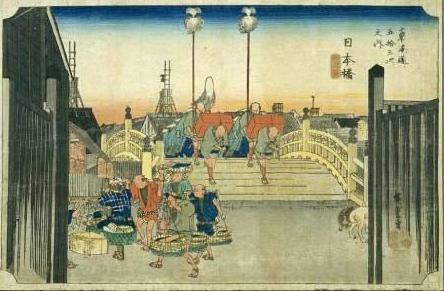 During the Edo Period (1603-1858), when Japan was under the rule of the Tokugawa Shogunate, the Tōkaidō was a busy route mostly travelled on foot, or by Kago or Norimono (each a kind of sedan chair or palanquin borne by four or more bearers), or travelled on horseback. Travel along this road was a very popular subject in the art and literature of the time. Japan’s most famous poet, Matsuo Bashō (1644-1694), wrote of his travels along the Tōkaidō; and, perhaps most famously of all, the Ukiyo-e artist, Hiroshige (1797-1858), depicted 53 stations along the Tōkaidō in several different editions of woodcut prints. The Tōkaidō “corridor” is still a major transportation route connecting the greater Tokyo region with Nagoya, Kyoto and Osaka to the west. Two rail routes, the JR Tōkaidō Main Line and the Tōkaidō Shinkansen (Bullet Train), and two modern road routes, the Tōmei and the Meishin Expressways, still echo the winding course of the old Tōkaidō. But portions of the old road still exist, meandering quietly forgotten through quiet, tree-shaded stretches of the Japanese countryside. I first walked a section of the old Tōkaidō at Hakone in 2003 and again in 2009; and I have also sought out other places along the old route, such as the official starting point of the Tōkaidō at Nihombashi in Tokyo, now a grand stone bridge near the upmarket shopping area of Ginza; as well as a stretch of the old road which is still lined with shabby old fashioned wooden buildings near Shinagawa; and, finally, the official terminus of the old route at the Sanjō Bridge in Kyoto. Hakone is the 10th station depicted in Hiroshige’s various series of prints. It is said to be the steepest and most arduous stretch of the Tōkaidō, and, in some parts, in the wrong kind of weather, the large rough stones could well be shin-breakers if you happen to be unfortunate enough to lose your footing. Hakone is not too far from Tokyo and can easily be reached by train on the Odakyū line from Shinjuku Station. 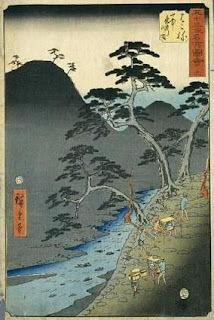 I began my first Tōkaidō hike in 2003 at Hakone-Yumoto. Setting out with the aid of a not very good map I eventually found the old paved road breaking off from the modern roads snaking up through the densely forested hills. This is where one first gets a feel for what the old Tōkaidō must have been like in Edo times, although it’s certainly much more peaceful nowadays. 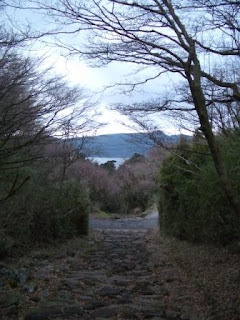 I made my first trip along the Hakone stretch of the Tōkaidō in winter and my second trip there in spring, and the weather on both occasions seemed to mirror that experienced by Matsuo Bashō when he passed this way in 1684. 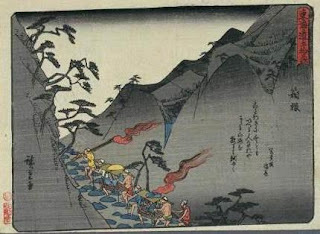 In his Nozorashi kikō (Journal of a Weather-beaten Skeleton) Bashō states that it rained all day and the mountains were hidden by cloud when he passed through the Barrier at Hakone. Like Bashō I didn’t see Mount Fuji on either occasion; this seemed somehow appropriate, making me feel all the more at one with the Edo period of the famous wandering old poet in whose footsteps I was following. The gentle drifts of rain rattling the thickets of bamboo alongside the road, bringing out the fresh woodland scents of the hinoki (cypress) and sugi (cryptomeria) trees, as I climbed on up the steep slopes – an elemental sense of nature surrounding the Tōkaidō, grounding one’s focus, I thought; providing both Bashō and myself with a more down-to-earth enjoyment, rather than the usual stunning and majestic views of Mount Fuji, which the area is apparently most famous for. After passing through the small village of Hatajuku one follows the best preserved and most enchanting stretch of the Tōkaidō. Here the rugged stones wind their way up and up through misty hills. Eventually you pass the Amazake-jaya, an old thatched wooden traveller’s rest-house, where you can purchase a hot cup of o-cha (green tea) or some warm amazake (alcoholic rice wine), with Japanese mochi sweets. Continuing on you eventually reach the crest of the hilly ridge and begin to descend towards the small town of Moto-Hakone, on the shores of Lake Ashi. 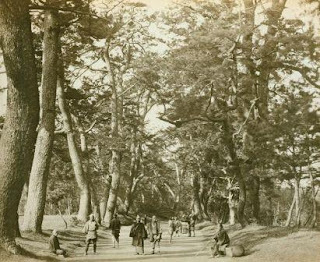 Here extends a flat stretch of the Tōkaidō, shaded by two majestically tall rows of cryptomeria trees, which were planted in 1618 and are now designated “natural treasures” of the nation, at the end of which is the Hakone Sekisho, or Hakone Barrier. The Barrier was a check-point, effectively a gated compound through which all Edo period travellers had to pass, where they would be searched, their possessions inventoried, and questioned as to their business by government officials. The Barrier was often a gruesome place to behold as the road either side of it was often ‘decorated’ with the crucified remains of criminals. The passing traveller’s progress through the barrier was watched over by a scaffold bedecked with severed heads. When I first visited the site of the Barrier in 2003 it was still under archaeological excavation, and returning in 2009 I found it was now the site of an impressively evocative, full and accurate reconstruction (minus the crucified criminals and severed heads, happily). There is also a small museum which explains more about the Barrier’s function, placing it in the wider context of Japanese society during the Edo period. 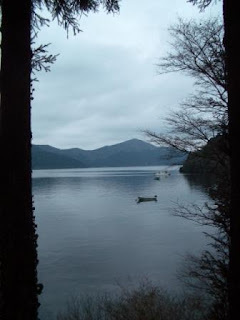 From here there are several fine views of Ashi-ko, or Lake Ashi, as well as Mount Fuji – if the weather permits!